Active learning classrooms are intended to maximize the quality of learning experiences by providing classrooms that are designed to stimulate and sustain active and engaged learning. The Active Learning Classrooms at UWM (ALCs) are designated as general classrooms through the Registrar’s Office and are available for UWM instructors for classroom use. ALCs are designed to maximize the quality of learning experiences, stimulate interaction, and sustain active and engaged learning. ALCs are uniquely constructed as open structures with mobile chairs and tables arranged for learning in small groups of varying sizes. Each room varies in its provision of media infrastructure, flexible furniture, whiteboards, projectors, instructor consoles. The ALCs have a variety of layouts that allow small groups to share table space, computer monitors, whiteboards, and the ability to display information across individual or multiple monitors and screens. These design features built into the rooms increase student engagement through interactive, collaborative learning with peers and intensive use of small group pedagogy. The first UWM designated ALCs opened in spring of 2015 with five varying sized rooms in the Northwest Quadrant. Several larger ALCs in Cunningham Hall and one in the Kirkwood Interdisciplinary Research Center (KIRC) soon followed. Two more ALCs have been made available in Enderis Hall and Mellenkamp Hall. Please see the chart following the photographs for specifics on seating capacity and technology. How Can I Schedule Use of the ALCs? The ALCs are designated as UWM general classroom spaces that positions them within the Registrar’s course scheduling process through PAWS and controls access and reservations. The Registrar’s Office will send out an email each fall and spring semester to alert all instructors to arrange their requests for any classrooms, including ALCs, through their department schedulers. Deadlines for fall classroom requests take place sometime in February and spring classrooms request deadlines occur in early fall so please plan accordingly. Very popular course time slots commonly result in multiple requests for the same time slots. The Registrar’s Office typically contacts the classroom instructor and attempts to arrange flexibility in time or date in order to accommodate as many requests as possible. Due to the limited UWM classrooms, some instructors may be placed in the ALCs without having requested them. To request an ALC room for Summer or Winterim sessions, please e-mail ROAR@uwm.edu and indicate the course and section number of the class, and your building/room preference if there is a specific ALC you are interested in. Anyone seeking to schedule non-course events in the ALCs must use the Registrar’s room reservation system ROAR. How Do I Obtain Support and Training for ALCs? Professional staff look forward to helping you achieve success in the ALCs! Two main units provide ongoing support and training for your successful use of the ALCs. 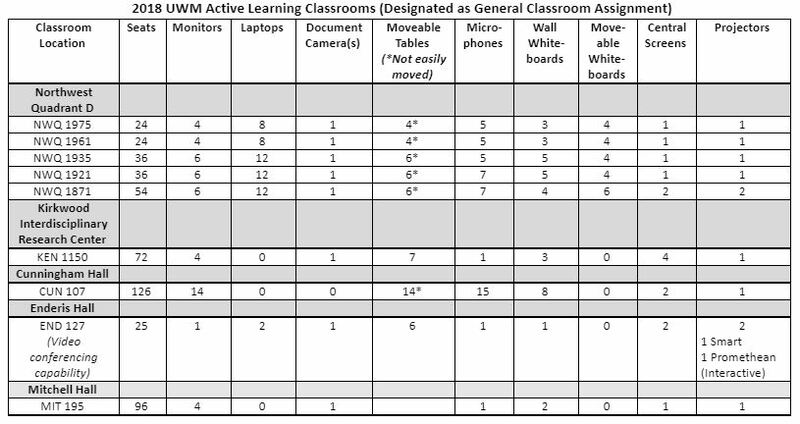 The Center for Excellence in Teaching and Learning (CETL) has compiled an Active Learning Classroom Guide Guide that provides a summary of the UWM ALC Assessment Team study results. In addition, CETL provides multiple workshops that help prepare instructors for teaching in the ALCs. These workshops help you embed active learning strategies throughout your course at the level you are comfortable with establishing. We will help you to prepare students for becoming active learners and guide you establishing expectations for role and a classroom community. **Several of these workshops provide optional Certificate enrollment. To reserve a spot in the CETL workshops. Contact CETL for arranging a confidential one-on-one appointment to discuss your specific active learning classroom strategies, course design, and engaging students. Contact Connie Schroeder, CETL – 414-229-5764 or connies@uwm.edu for access to additional Certificate materials in D2L/Canvas. How Are UWM ALCs Managed? The ALC initiative is a collaborative effort involving multiple units, offices, and leadership at UWM. The UWM ALC Steering Committee is comprised of representatives from across the disciplines and ALC building spaces, including, Registrar’s Office-Ex Officio, Director of Client Services University Information Technology Services, University Information Technology Services, and is chaired by Connie Schroeder, Senior Consultant at CETL. The ALC Steering Committee meets several times each year to plan, vote on and implement issues regarding policies, promotion and marketing. A sub-committee, The ALC Assessment Team, has been very active in collecting data from UWM ALC instructors and students during the first three years of the ALCs. Research has shown both active learning and active learning classrooms foster increased engagement, peer relationships, retention, processing of information and student achievement. The following links provide research published on the use and impact of ALCs.